Produced by Serengeti Breweries currently one of Tanzania’s top beer brands, Serengeti Premium lager was re-launched in 2003 as a 100% malt beer and has since been a trend setter in many regards. 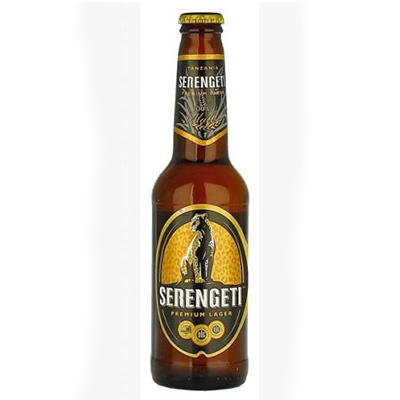 Serengeti premium lager is commonly referred to as Chui (Swahili for Leopard) in Tanzania which comes from the black and gold leopard spots acclaimed on the brand’s label. The leopard and acacia images on the label are symbolic of the Serengeti National Park to which the brand is associated. It is available in 500ml and 330ml brown bottles.